South Lighthouse Fair Isle. A great journey - a great place to stay! Travelling to Fair Isle is part of the adventure. As you might expect, visiting Britain's remotest inhabited island does require a bit of forward planning - and a flexible timetable! - but it's not too difficult and you will find it well worth the effort. The secret is to decide when you would like to visit, check that there is a vacancy and then BOOK transport to the island as soon as you can (details below), arranging the rest of your journey to tie in with this. Daily, except Sundays, Airtask fly to and from Tingwall in Shetland. Passenger spaces are limited so please ring 01595 840246 for bookings and information. On Mondays and Fridays only Loganair fly from Kirkwall in Orkney Passenger spaces are limited so please see their website for bookings and information. There are also regular flights to Sumburgh airport** from a number of British locations, including Orkney. 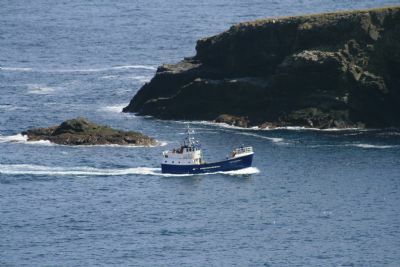 The Good Shepherd usually docks at Grutness at the extreme south end of the Shetland Mainland. This is very close to Sumburgh airport, which can be reached on foot or a short bus ride. Every second Thursday The Good Shepherd sails all the way to Lerwick. Fair Isle's planes usually fly to Tingwall airport**, just outside Lerwick. There is no regular public transport between Tingwall and Lerwick but a subsidised taxi can be arranged (details below*). 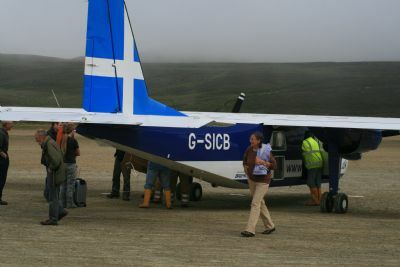 On Saturdays there is also a flight between Fair Isle and Sumburgh airport**. Drivers may wish to bring their car to Shetland on the Aberdeen-Lerwick ferry and leave it at Tingwall or Grutness. Only a very limited number of cars can be carried on the deck of The Good Shepherd but if you do require a car it is possible to hire one on the island. For more detailed travel information, including how to get here in the winter months, please contact us. TTTTUUUsers of advance tickets valid for a specic journey should allow for delays. Those exploring Shetland should visit Fair Isle early in holiday. Visitors may wish to consider travel insurance. The Good Shepherd and DirectFlight only charge for journeys undertaken and if delayed they will carry you on their next available trip. *The subsidised taxi service from Lerwick to Tingwall is operated by the Shetland Islands Council - to book a taxi please ring 01595 745745 during weekday office hours and no later than the day before your journey.